I'm just guessing the religion of the knife-wielding attacker -- who stabbed multiple innocents at UC Merced -- based upon his name. 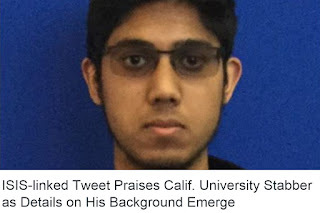 ...investigators, including the FBI, were still trying to determine the motive for Mohammad’s attack, which wounded two students, a female student advisor and a construction worker who was on campus for a remodeling project. The four suffered non-life-threatening injuries. ...Byron Price, a 31-year-old construction worker, was leading a crew in a nearby room when he heard the commotion and went to intervene. Warnke described Price’s actions as heroic... “Without him, the first victim could have been a lot worse off, or even dead,” he said. ...Two university police officers chased Mohammad to a bridge on the campus, where he was shot and killed. The identities of those officers have not been released. One of the officers was placed on an automatic three-day leave from the department, a standard protocol in officer-involved shootings. Reacting to the news, Sen. Barbara Boxer (D-CA) proposed new regulations that would require citizens to register their knives and would allow victims of attacks to sue knife manufacturers for malicious use of their products. "Reacting to the news, Sen. Barbara Boxer (D-CA) proposed new regulations that would require citizens to register their knives and would allow victims of attacks to sue knife manufacturers for malicious use of their products." Liberals are truly sick people. And dangerous to our liberty and safety when in positions of power, whether government or otherwise.